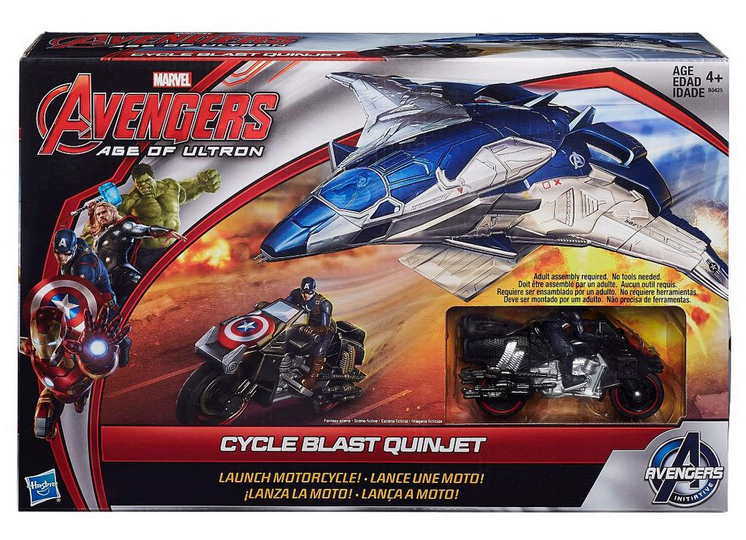 It has recently been reported by Jenna Busch at Legion of Leia that Hasbro opted to solicit a toy based on one of the more exciting scenes in the recent Avengers: Age of Ultron movie. In this particular scene, S.H.I.E.L.D. agent and Avengers member Black Widow springs into action by dropping out of the Avenger's Quinjet on a suped up motorcycle. It's a pretty amazing sequence and a scene I look forward to watching repeatedly in the future. It's one of those ideal moments when film manages to capture the magic of the comic book page and translate it into real life. Throughout a progression of Marvel inspired films, Scarlett Johansson has managed to bring the Black Widow character alive on the screen with a nice balance between snark and charm. This moment was created to give her character a well-deserved action spotlight. This makes the scene an ideal choice for a toy play set based on the film. Hasbro's play set based on the scene doesn't include Black Widow. It doesn't include her in the box as an action figure, and it doesn't feature her as a member of the Avengers on the cover of the box. This is a huge problem that has been discussed at length on a number of Feminist and Geek sites. 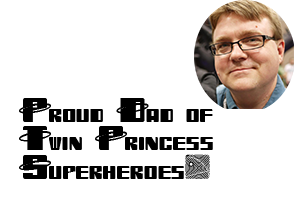 If you are interested in their discussion, and you should be, I'd direct you to start with the Legion of Leia and The Mary Sue and move on from there. 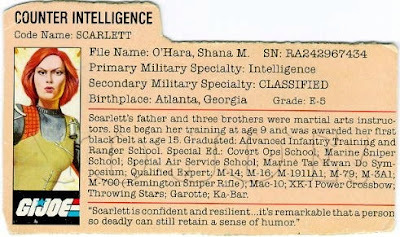 Even though I'm the father of seven year old twin daughters who adore Black Widow as on of the - too few - female super heroes featured on a regular basis, I don't have anything to say from that perspective that hasn't already been said better. Instead, I thought I'd take a moment to address what I believe is an underlying assumption that informed Hasbro's decision to exclude Black Widow from their offerings. Surprisingly, this isn't the assumption that these toys are "for boys." That may be one of the assumptions over at Hasbro HQ, but I think this falls into the "boys wouldn't want to play with girls as toys" sub-category of that assumption. I think that Hasbro not only assumes that these toys are for boys, but that boys would have no interest in pretending to be Black Widow battling the minions of Hydra and Ultron. They are wrong on so many levels. Way back in the before times, in the not now, when the consensus view of the 21st century was Zardoz... Okay, that time never existed, but let's stick to the before times, in the not now. A time we will call "The Eighties." During this dark and mysterious age, action figures were a relatively new phenomenon. Sure, full sized GI Joe's had been around for a while, but the smaller action figures that would come to dominate the action figure market were relatively new. I don't know if Star Wars action figures were the first of this new line of toy, but they were an early one and they inspired toy makers to create new action figures for kids to play with. Those toys included a new and exciting line of GI Joe action figures that tied in with an animated TV show of the same name. The first "series" of Joe figures included three characters who were then, and are now, my favorite characters in that line. I played with those toys for hours on end. I pretended to be these characters as they battled COBRA and its nefarious plots. To me, these three characters are my "core Joes." They define who I most liked imagining myself to be. 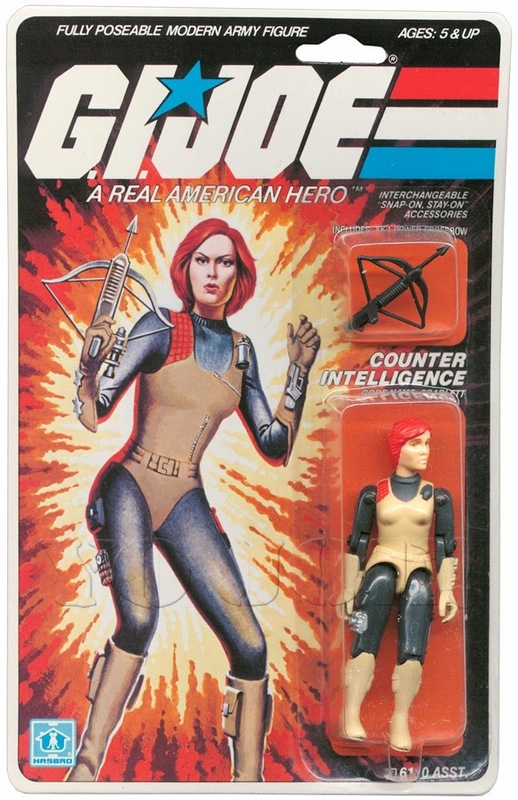 They were Snake Eyes, Stalker, and...in a turn that makes Hasbro's decision to cut a character played by Scarlett Johansson all the more ironic. What was the name of the company that made this mysterious female toy that both boys and girls (ages 5 and up) could play with? 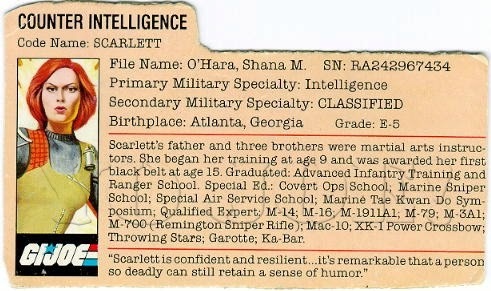 As I mentioned earlier, Scarlett was one of the characters I most liked to role play when I was fighting against Cobra. She had an awesome skill set, just look up and check it out, and she had a hand crossbow. A freakin' hand crossbow! So I'd just like to add to the chorus of voices that are pointing out that young girls just as valuable as consumers, fans, and players. That it is also true that there are probably young boys out there who would be eager to pretend to be Black Widow as she defends the world against the forces of Hydra. Heck, I even know a father of seven year old twin girls who would jump at that opportunity.